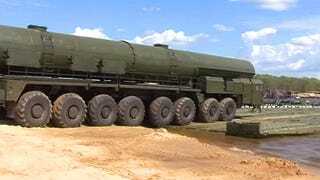 Russia’s new RS-24 “Yars” intercontinental ballistic missile, which entered service in 2010, is one of the most destructive weapons mankind has ever produced. Here it can be seen being leisurely ferried across a river on a barge, as if it’s just going for a calm ride on the lazy river. The RS-24 is an evolved cousin of Russia’s Topol-M missile, and was developed to beat American ballistic missile defense systems using a series of tactics. These include raw speed, low initial infrared launch signature, advanced decoys and possibly maneuvering independently targeted reentry vehicles (MIRVs). The three stage solid fueled RS-24 is rumored to be capable of carrying up to ten multiple independently targeted reentry vehicles, although three to four are most likely carried operationally. Each warhead packs 100 to 250 kilotons of apocalyptic firepower. Not only is the RS-24 powerful and cunning, it is also accurate, with a claimed circular error probability of just 150 meters over a range of almost 7,000 miles. When the RS-24 is loaded onto its massive MZKT-79221 16x16 teletransporter-erector-launcher (TEL), the largest of its kind in the world, the whole package tips the scales at a whopping 250,000 pounds. The transporter itself is a modern marvel, able to steer its first, second, third, sixth, seventh and eighth axles. It also has an elaborate independent hydro-pneumatic suspension system with a central tire inflation system. Two separate cabs can control the vehicle, one on each side of its 800 horsepower engine. The TEL, when loaded with a live missile, is accompanied by command and control and security vehicles at all times. The RS-24, along with its Topol-M predecessor, are quickly becoming the backbone of Russia’s land-based nuclear deterrent, with silo-based, road mobile, and in the future, highly camouflaged train-based RS-24s making up almost all of Russia’s Strategic Missile Troops capabilities by the next decade. This is all part of a militarily resurgent Russia’s ongoing initiative to revamp its nuclear capabilities, an move that along with President Putin’s constant references to Russia’s huge nuclear arsenal has caused concern among eastern European and NATO nations.